Khalifa Qattan gained interest in art while he was a student in the Mubarakiyah School. His teacher used to encourage him to go out to observe life in the city and draw the scenes from the beach or the marketplace. He continued to practice and produce basic art work even after he left school and became a teacher in Al Najah School. In 1953 Qattan held what is now known as the first single-artist exhibition in Kuwait. One of the outcomes of this cultural event was Qattan gaining a scholarship to study abroad. During the same year Qattan traveled to the UK to study woodwork machining in Leicester Collage of Technology. Although the field of his study was more technical than it is artistic he still educated himself by visiting art exhibitions and participating in art events whenever he could while he was in Europe. The 5 years he spent in the UK gave Qattan a good exposure to both modern and classical visual arts, an exposure which he never got while living in the mid-twentieth century Kuwait. 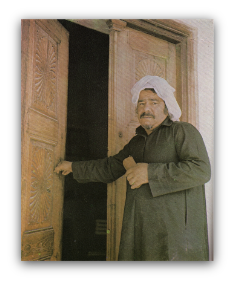 After Khalifa Qattan returned to Kuwait in 1958 he worked as a teacher in Shuwaikh Technical School and later as a building supervisor. During that period Qattan was practicing art while working in a Cubist style, similar to artists such as Braque and Picasso. From the late 1930s when Qattan started his schooling until the 1960s after his return from the UK, Kuwait was going through a phase of rapid and dramatic change in every aspect of life. The economic boost driven by the production and exportation of oil caused -in one way or another- a major social, political and cultural shifts in the developing country. Qattan witnessed and observed those changes, be it positive or negative, and expressed his observations through his art. The Cubist painting style started to change into a new 'thing', until in December 1962 Khalifa Qattan announced the birth of his new art style and theory… Circulism.